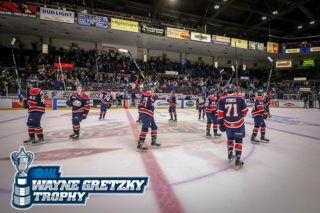 SAGINAW, Mich. – On Saturday night, the Saginaw Spirit (29-29-9-0) hosted the London Knights (39-21-2-2) for the final home game of the regular season at The Dow Event Center. Also marking Fan Appreciation Night, the Spirit honored overage players Evan Cormier (60thgame of the 2017-18 season), Mason Kohn and Marcus Crawford before the puck drop. After a video chronicling their time in a Spirit uniform, Saginaw carried that momentum into the first period as Jake Goldowski scored an early goal to kick off the action. London answered, though, as the two teams entered intermission tied 1-1. After the Knights added both a second period goal and a quick third period score (36 seconds elapsed), the Spirit embarked on a two-goal comeback late in the period thanks to Caleb Everett and Damien Giroux. 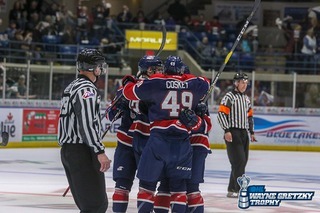 After the two late Spirit goals forced overtime, London’s Evan Bouchard sealed the victory for the Knights but not before the Spirit could record one point in what is a tight battle for playoff positioning. In the first period, Goldowski’s quick work gave the Spirit faithful something to cheer for on Fan Appreciation Night as he scored with 13:29 remaining in the first period, his 11th goal of the year. On the play, Detroit Red Wings’ prospect Reilly Webb fired a shot from the point that required a bit of perseverance from Goldowski to put the rebound home. Max Grondin was also awarded an assist on the play. Later on, London tied the game at one goal apiece with7:50 left in the frame. Knights defenseman Evan Bouchard began the scoring effort with a backdoor pass to Cole Tymkin, who then centered the puck to a waiting Tyler Rollo to deposit the one-timer goal and even the contest 1-1. In addition to the tied score, both teams registered a matching 15 shots on goal in the first stanza. 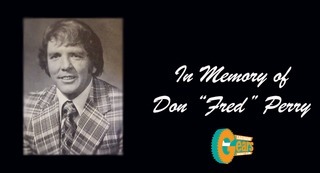 In a physical second period featuring a punishing hit from Cole Coskey, the London Knights seized a one-goal lead towards the middle of the frame. With 10:34 left, Nathan Dunkley caused a takeaway deep in the Spirit zone, creating a quality chance for the visiting Knights. Dunkley then dished a no-look pass to Alex Turko, who finished the play with a snap shot directly into the Spirit goal. In the shots department, London outshot Saginaw by a 10-9 margin. During the final frame, cooler heads prevailed as the Spirit attempted to erase the one-goal deficit. Instead, London extended its lead on the period’s first shift when Alex Formenton, an Ottawa Senators draft pick, sent a wrist shot from the left circle into the Spirit net to create a 3-1 Knights lead. The Spirit remained aggressive, though, as Blade Jenkins created space for himself near the left circle before passing to Caleb Everett near the blue line. Everett launched a shot that ended up in the twine for his 6th goal and 20th point on the 2017-18 season. The Spirit struck once again with the club’s 3rd goal of the night coming just 55 seconds after Everett’s tally. On the play, Damien Giroux displayed exhibited grit as he forced a wrap-around attempt into the net with 2:47 left in the third period. Once overtime set in, Evan Bouchard, a potential top-10 draft pick in the 2018 NHL Draft, had one shot denied but stayed on the puck and eventually deked between Spirit defenders to put the game-winning goal top shelf in the Spirit net. 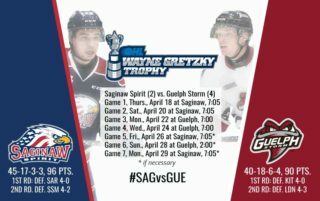 The Saginaw Spirit (29-29-9-0, 67 points, 8th in Western Conference) will travel to Windsor to take on the Spitfires (31-30-4-2, 68 points, 7th in Western Conference) tomorrow onSunday, March 18th, 2018 at the at the WFCU Centre. The puck drops at 2:05 p.m. 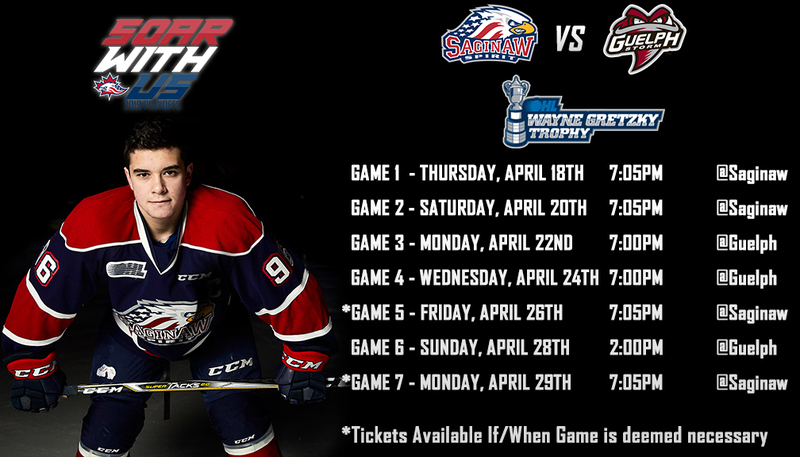 The Saginaw Spirit need a win in regulation to finish in 7th place. Season Tickets for the 2017-18 season are on sale NOW! 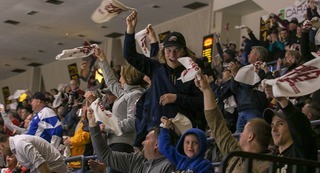 Reserve your seat at The Dow Event Center by calling (989) 497-7747 or visit www.saginawspirit.com for more information. YOUR Region. YOUR team. YOU’RE invited.